Timelessly adorable that’s perhaps one of the best descriptions for the farmhouse-themed decoration. Its popularity never fades away from time to time even though lots of decor styles keep being invented. 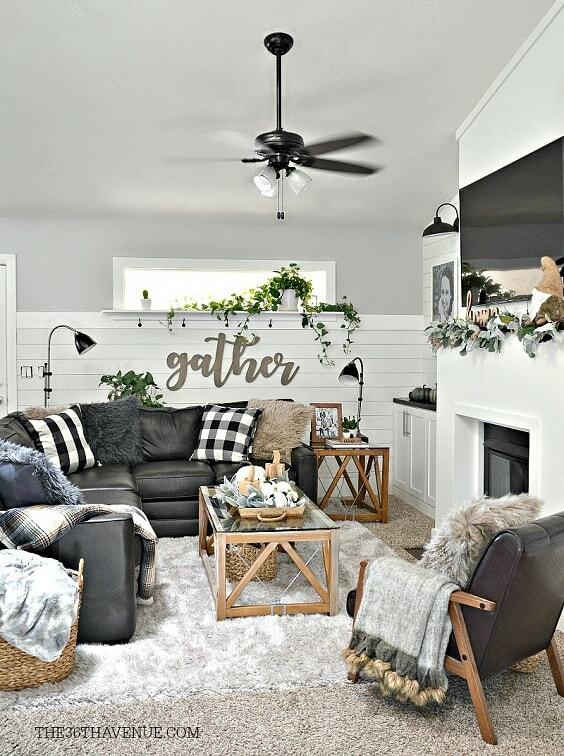 Many homeowners choose the farmhouse look to decorate their beloved home, and living room is surely a part that you can’t miss. Since the farmhouse nuance always creates such an inviting and comforting vibe, it’s always a great idea to apply the look to a living room. Combining the farmhouse style with a modern touch is mostly suggested by the home experts. It’s such a good way to make a farmhouse decor look much fresher. There are thousands of modern farmhouse living room inspirations that you can find on the internet. 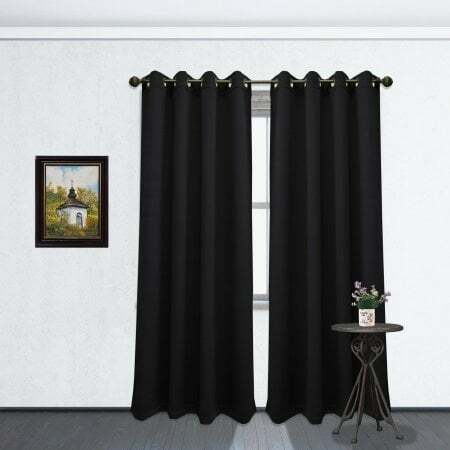 They look so tempting to copy to make enhance the beauty of your living room. 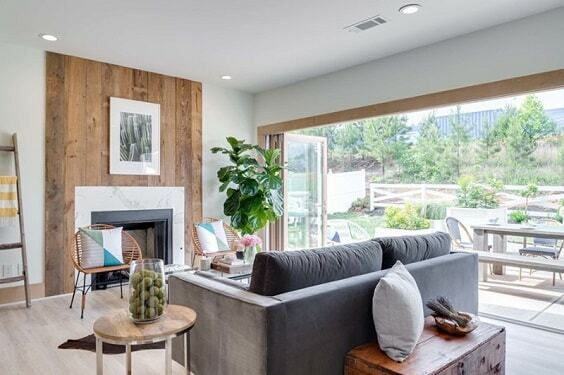 So here, we have picked some best modern farmhouse living room ideas that you can use as your ultimate reference. Let’s just keep scrolling to check them out! The huge glass window is one of the most popular additions that will make a living room look absolutely stunning and feel refreshing at the same time. Here, the bifold glass door is installed which complements a farmhouse rustic living room very well. This modern farmhouse living room shows an admirable mixture of the rustic element and bold color. The result is a captivating decor which looks beautifully harmonious. 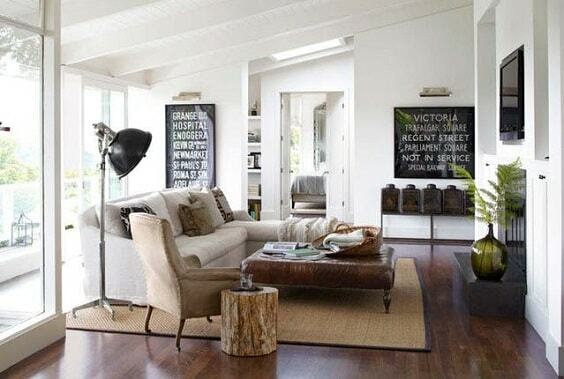 The gorgeous modern farmhouse living room in a neutral shade which is decorated by the natural stuff. It’s such a great inspiration to combine the comforting neutral nuance with the fresh natural elements. White and shades of brown dominate the overall look of this modern farmhouse living room which creates a mesmerizing bright decoration. The decoration is so simple yet very catchy with some unique pieces of furniture around. 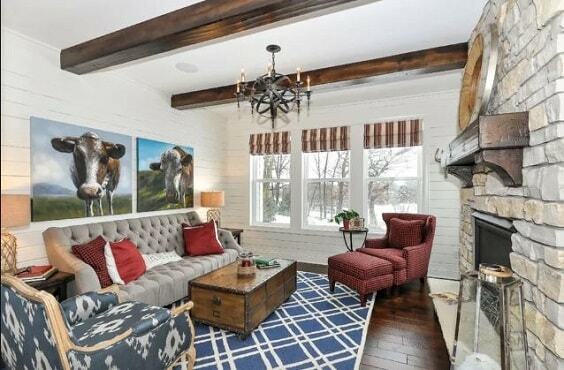 The chic modern farmhouse living room which is decorated with various elements. 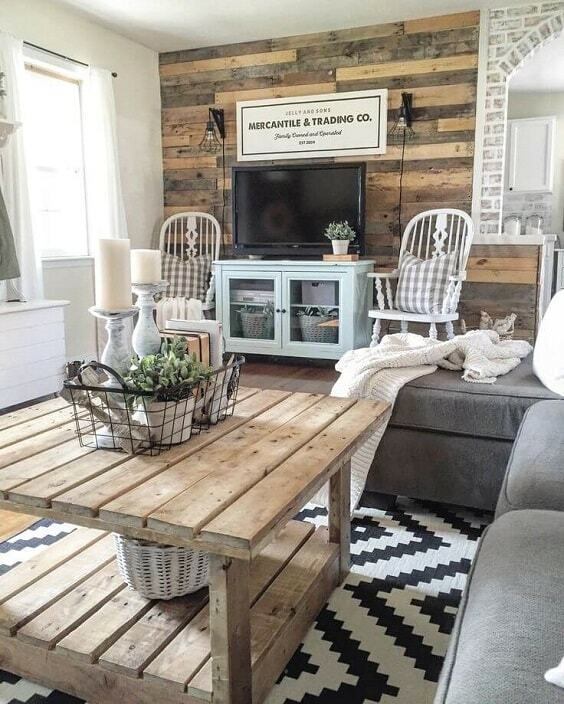 One side of the walls is covered with the reclaimed wood plank which is surely made as the focal point of the room. The black and white nuance always creates a very stylish look that everyone always loves. In this modern farmhouse living room, the shades are combined with the rustic touch which creates a gorgeous decoration that you can copy. A catchy decorative rug, various styles of furniture, and attractive decor items in this modern farmhouse living room are superbly awesome. 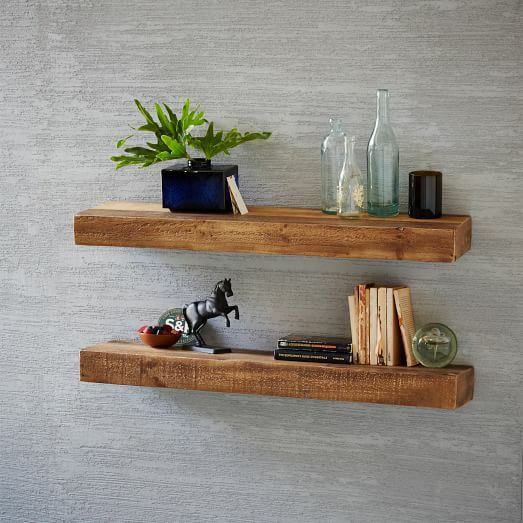 It smartly combines all those different elements to create a stylish decoration. 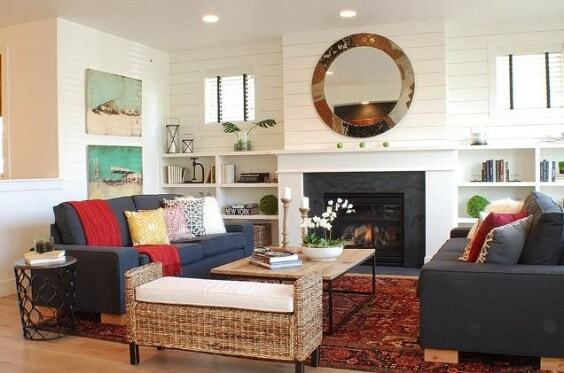 The simple modern farmhouse living room which can be a good inspiration for you who have a small space. You can see how a blackboard with some frames simply becomes a focal point of the room which makes it look way more attractive. 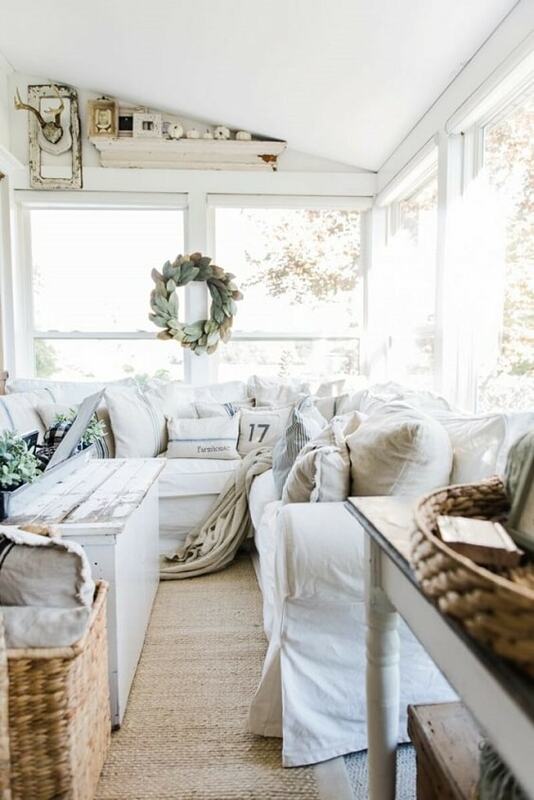 An all-white room is always a great option to make a gorgeously comfortable decoration. 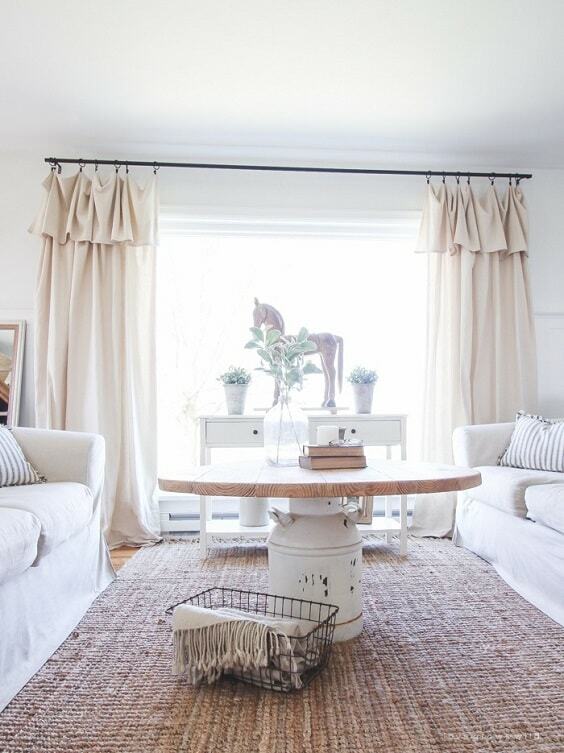 Here, white dominates the room’s overall look and the rustic elements colorize it beautifully. The huge fireplace made of concrete is surely the major focal point of the room which makes it look distinctively attractive. 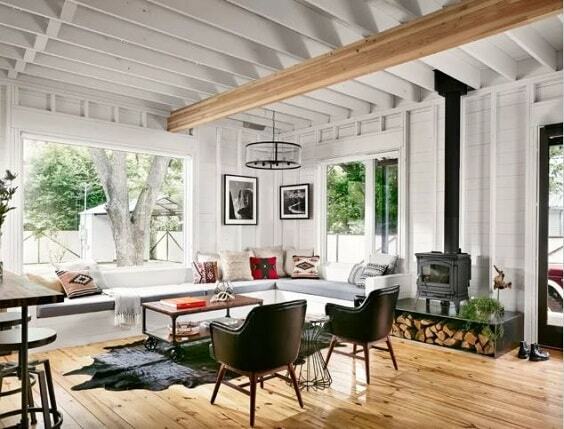 It’s a great inspiration for you who want to have a more masculine modern farmhouse living room. The exposed wood beam, wood flooring, and jute rug give a beautiful farmhouse vibe to this living room with the mid-century furniture. It’s such a good combination which creates a very stylish decoration to try. A blue and white area rug with the Morrocan pattern gives such a catchy statement to this modern farmhouse living room with rustic nuance. 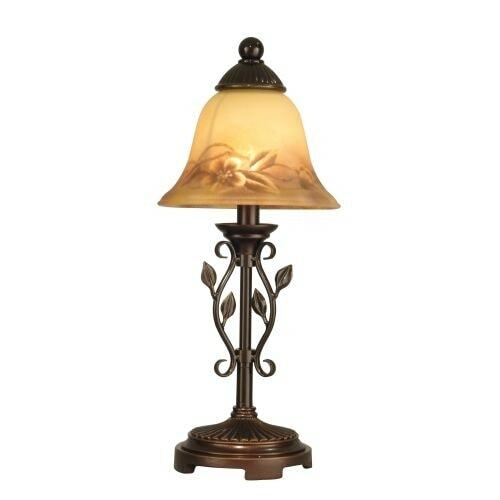 Then, a classic vintage chandelier in bronze makes the room look more glamorous. 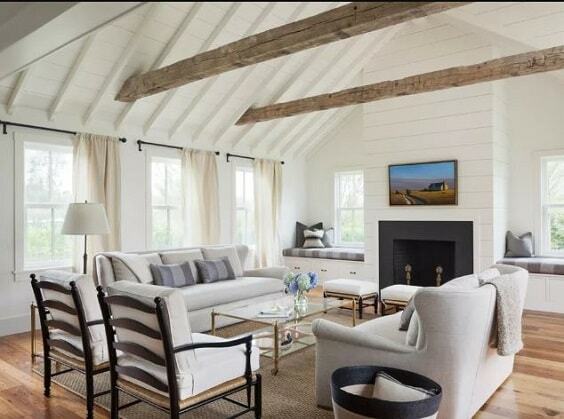 This is a good inspiration for you who want a decorative modern farmhouse living room with the neutral shade. 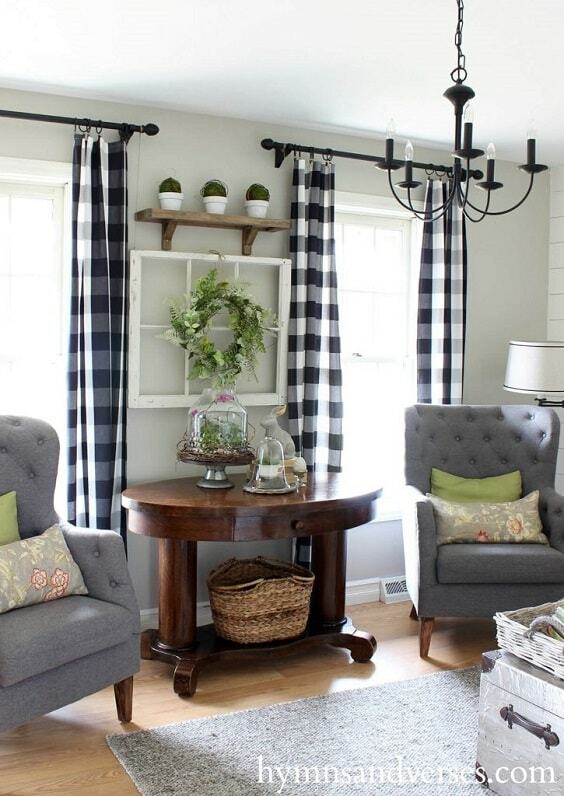 A pair of gingham drape, tufted-button chairs, and farmhouse decor items decorate the room in a very simple yet mesmerizing way. 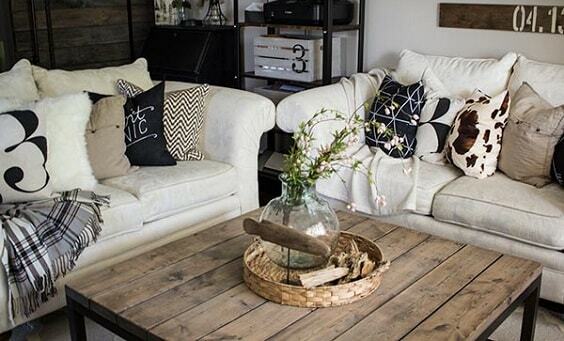 The vintage furniture decorates a country-style room which creates a captivating modern farmhouse living room. Some indoor plants also beautify the room which also gives a refreshing atmosphere. One of the decor styles that you can combine with farmhouse is the industrial theme. Here, the masculine furniture and furniture style up the room which complement the rustic elements gorgeously. Moreover, an industrial fire pit makes the room look way more attractive. Another mesmerizing inspiration for a festive living room with the calming nuance that you can add to your reference list. 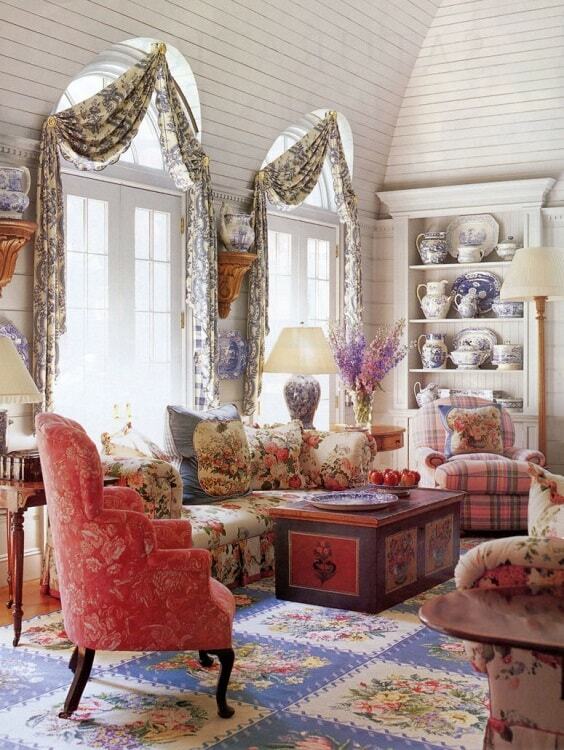 The decorative checkered armchairs are the main focal point here which complement the stripe wood flooring uniquely. 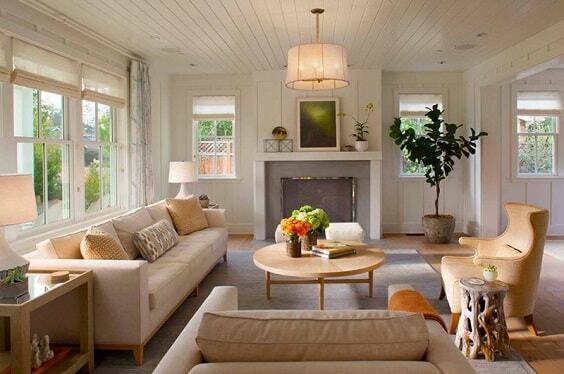 The comfortable modern farmhouse living room with the minimalist vibe which looks so elegant. The various style of furniture, wall arts, and indoor plants decorate this living room stylishly. 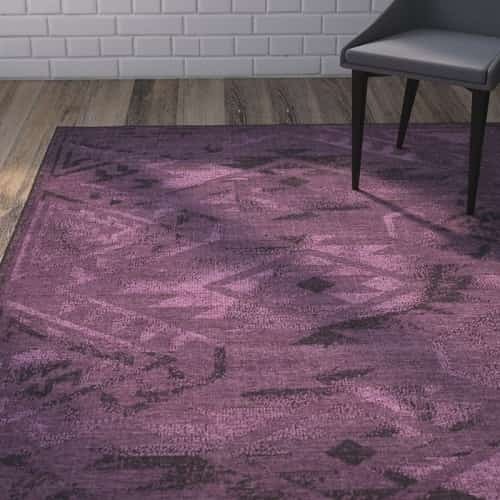 Again, a decorative area rug is made as the accessory which makes a modern farmhouse living room look so catchy. 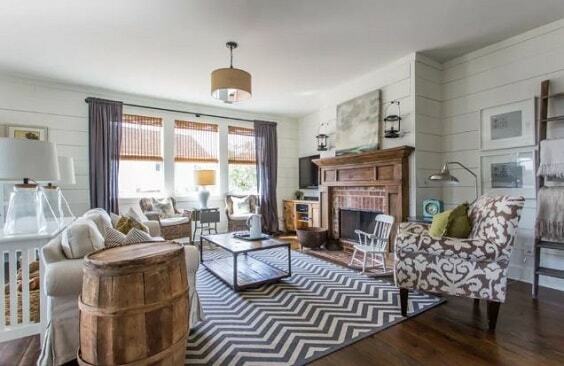 This one uses a rug with a chevron pattern to colorize all the rustic elements of the room stylishly. 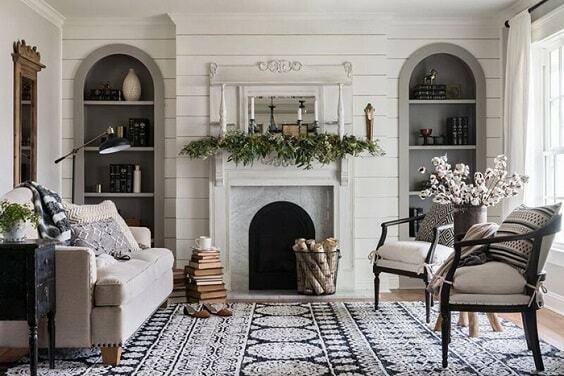 Basically, this one is an all-white living room, then a touch of grey and rustic colorize it gorgeously. Then, a unique decorative rug and crystal chandelier add a more luxurious flair to the room’s overall look. 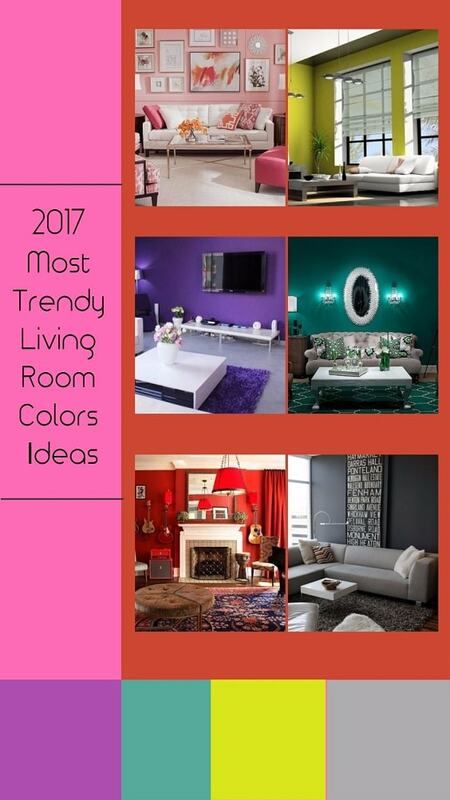 This one is an awesome inspiration if you want to have a superbly colorful modern farmhouse living room. The floral-themed furniture, accessories, and decor items in colorful look decorate this vintage living room which makes it look beautifully festive. 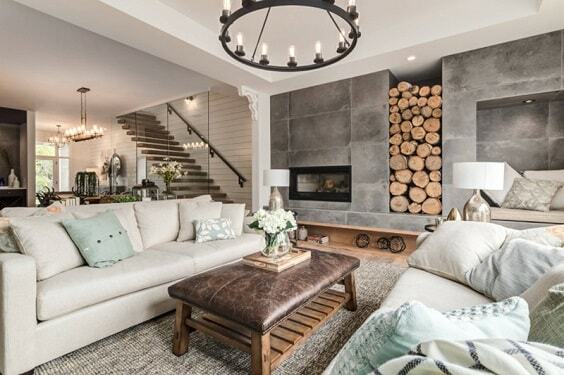 The elegant modern farmhouse living room with a nice combination of rustic and industrial touch. 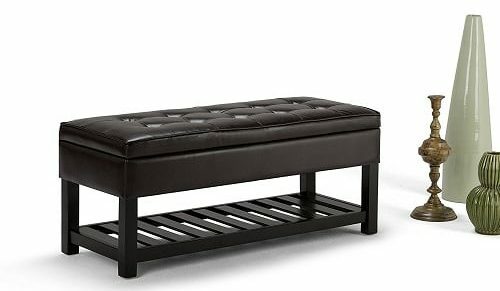 A tufted bench doesn’t only become an outstanding focal point among those white sofas but also make the room feel way more comforting. 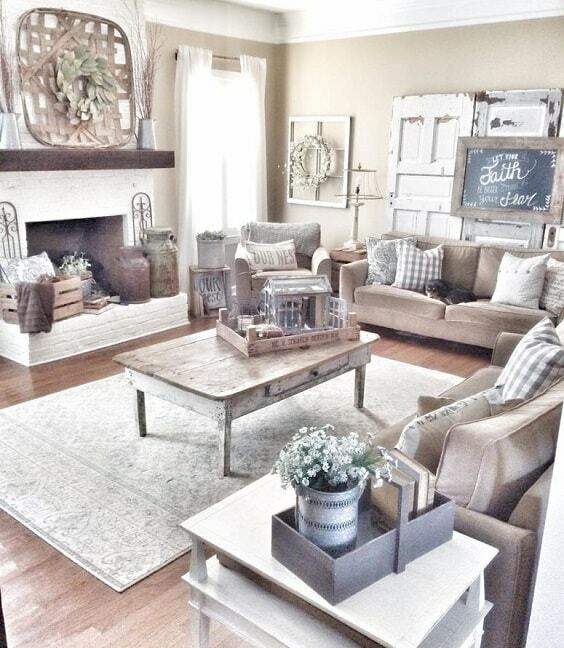 You can really feel an inviting rustic vibe with the decoration of this beautiful modern farmhouse living room. It can be a good reference for you who want to opt for an all-white nuance which looks more decorative in a very rustic way. 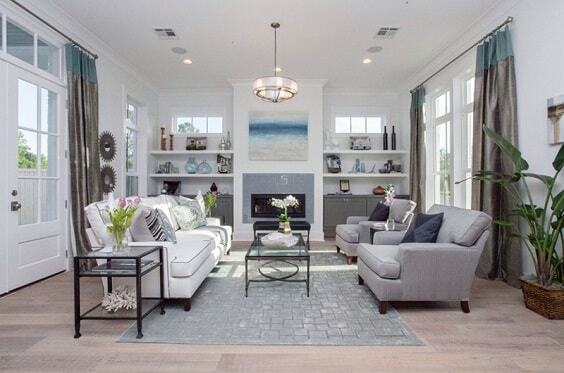 The soothing modern farmhouse living room with the neutral tone nuance which is the result of the combination of grey and white. Then, the rustic wood flooring and some indoor plants create a more refreshing vibe beautifully. 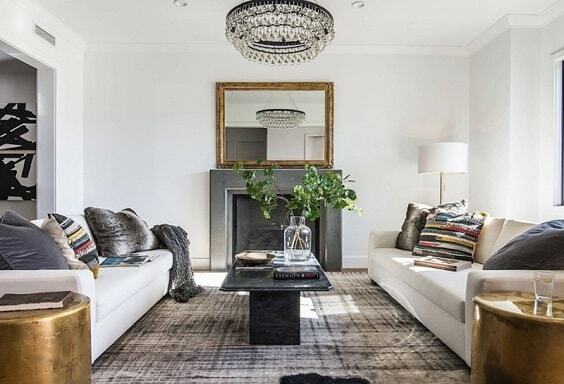 The tufted button sofa set, wicker storage ottoman, and jute rug in this living room create a chic textured decoration that you can simply copy. Moreover, its color mixture of white and natural brown gives a very relaxing nuance. The catchy rug with Mediterranean pattern brings the style of this modern farmhouse living room to a whole new level. 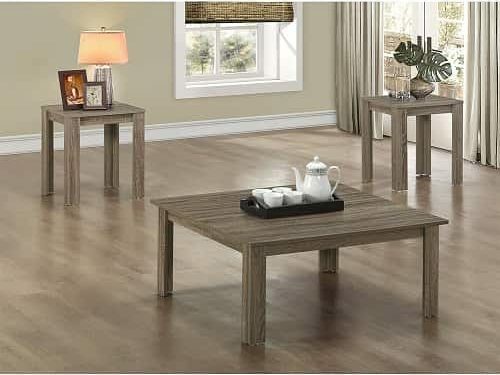 It gives a superb decorative touch to a neutral living room with a simple furniture. 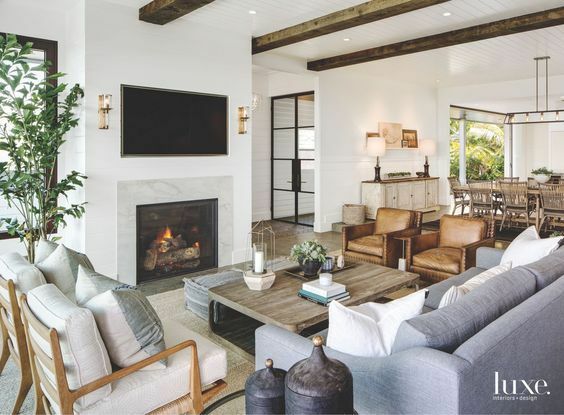 The combination of sandy wall and ceiling with the wood flooring in this modern farmhouse living room creates a warming atmosphere gorgeously. 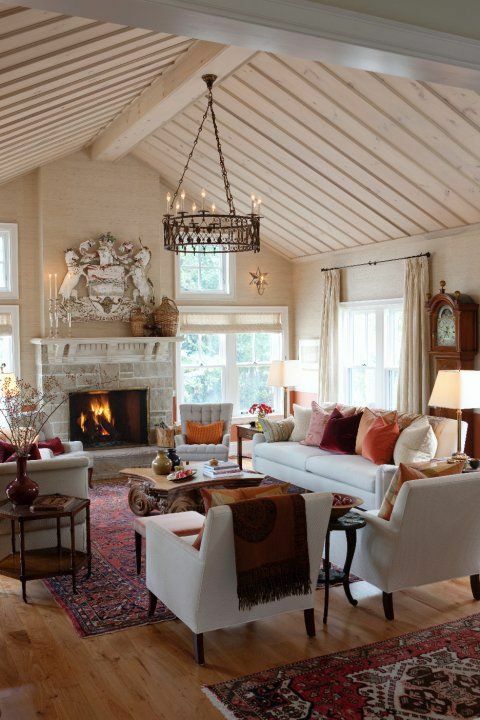 Even more, the red Persia area rug and fireplace makes the room way more comfortable to enjoy. 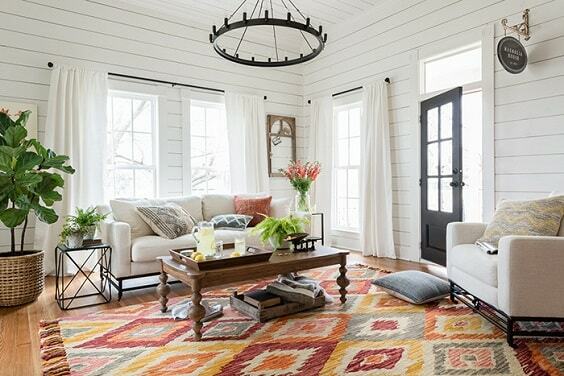 A bohemian textured rug in colorful look makes this modern farmhouse living room look much catchier. 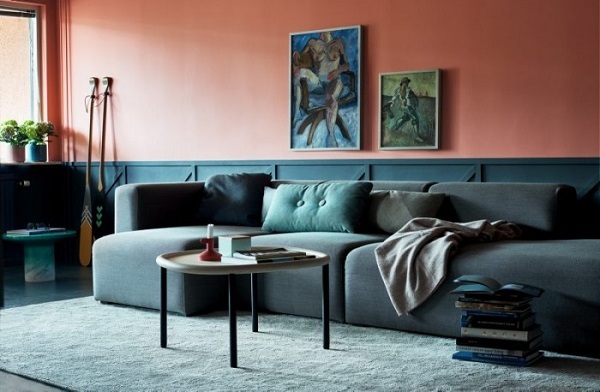 It’s such a good vibrant addition to colorizing a neutral rustic room. 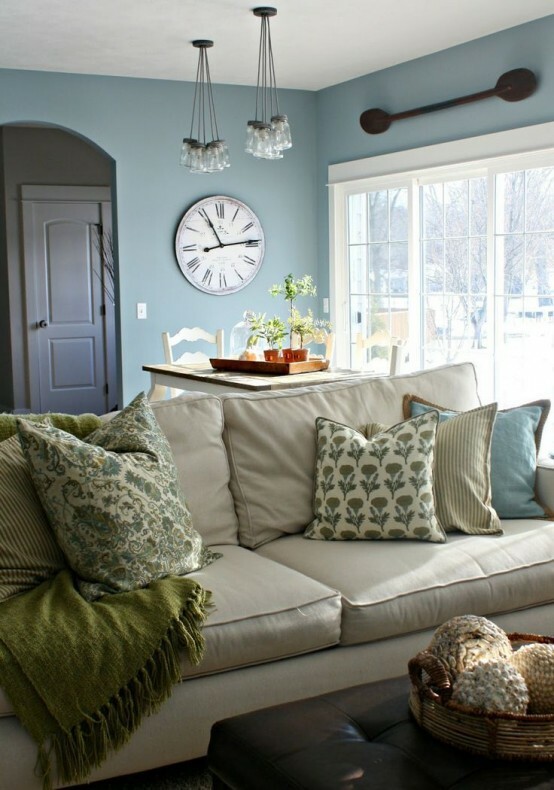 Soft blue can be one of the best options if you want to create a more colorful modern farmhouse living room. 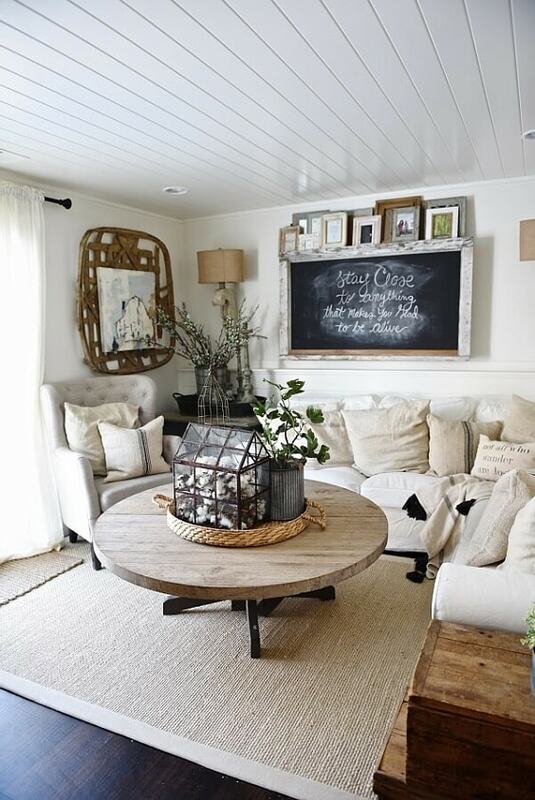 You can decorate it with some vintage decor items and furniture to emphasize the farmhouse nuance around. 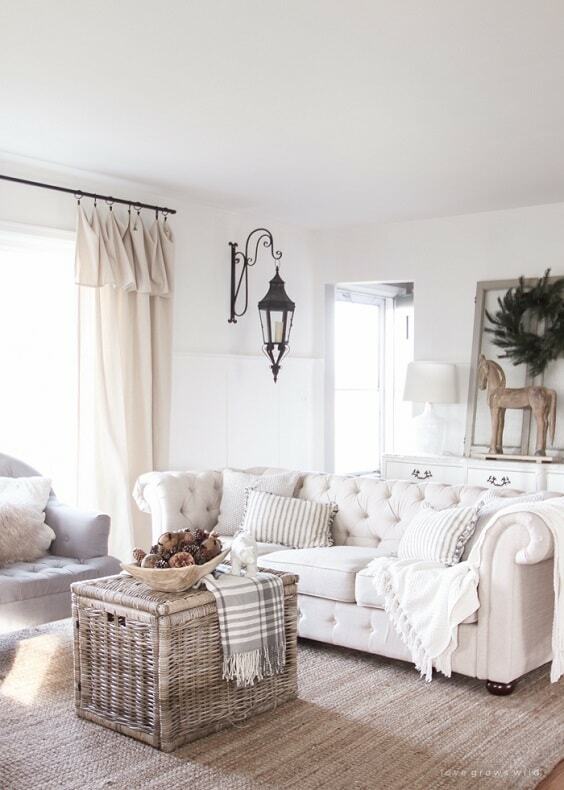 The chic modern farmhouse living room with the furry elements which feels so exhilarating to enjoy. It combines the farmhouse and boho decor styles in one layout stylishly. Its neutral color choices are enough to make the room look and feel so inviting. 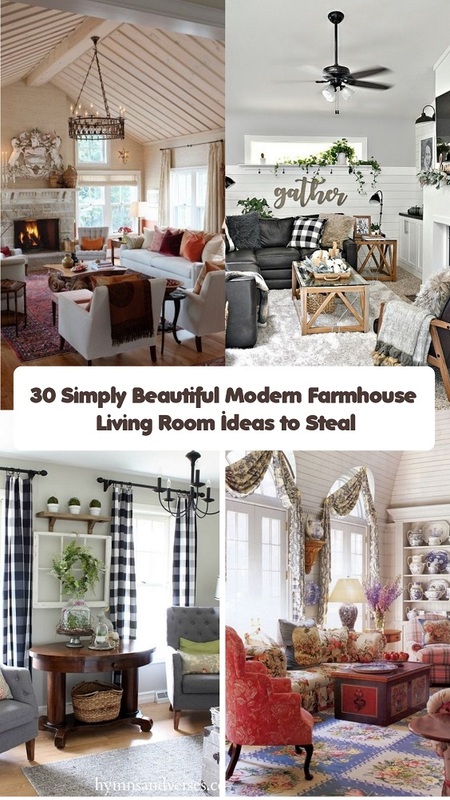 So those are some inspiring modern farmhouse living room ideas that you can add to your inspiration list right away. They beautifully combine the colors, furniture, accessories, and decor items which create a chic decor to copy. 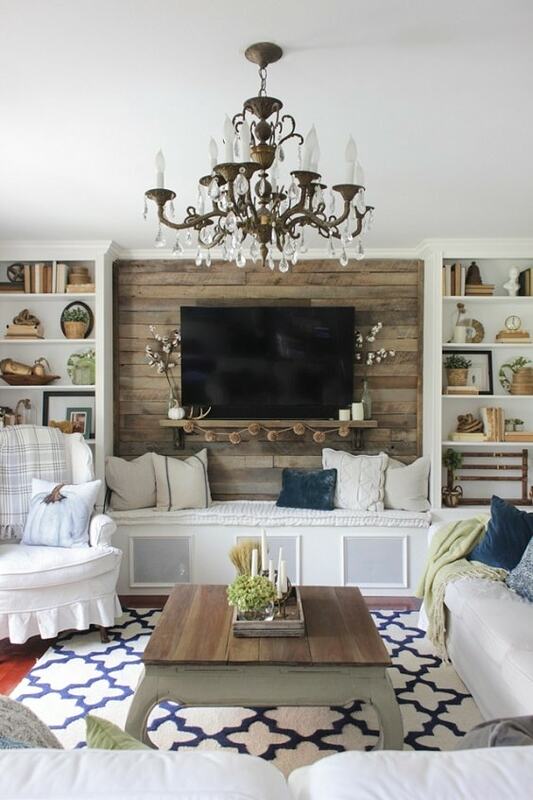 Choosing the farmhouse style to decorate your living room is never a bad idea since it will not look outdated from time to time. Furthermore, adding some modern touches to a farmhouse decor can make it look way more mesmerizing. Well, happy redecorating your beloved living room now!